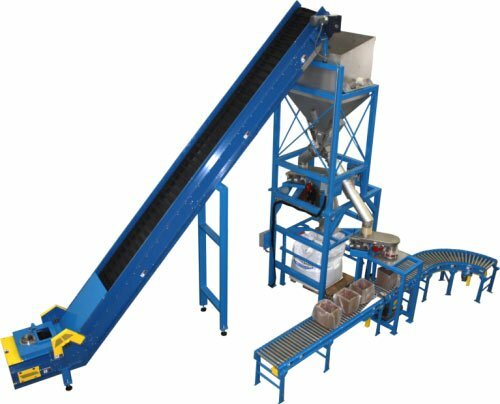 System is designed to fill bulk bags, gaylord boxes, and small boxes. Bulk bag/gaylord filling system includes fill head, and an inflatable spout seal. Two scale systems ensures accurate filling of all containers. All metal product contact surfaces are 304 stainless steel. The cleated belt conveyor system is 24’ long with a 47° incline. Belt conveyor transfers product from ground level inlet hopper to the surge hopper located on the main filler frame. The 60 cubic foot surge hopper includes hi /low level sensors to control product flow. Product from the surge hopper distributed by two vibratory feeders with variable speed controls. The small box filling station includes a fully automated 10’ long powered conveyor with box position sensors and weight control product shutoff. An air actuated diverter valve directs product to the bulk bag/gaylord filler or the small box filling station. Unit includes an Allen-Bradley PLC with a PanelView Plus 1000 color operator interface for system control. Controls are housed in a Hoffman NEMA 12 enclosure.